My children enjoy reading, they look forward to story time every night and they love adding new books to their library here at home! It's important to read with your children and there is nothing better than cuddling up in bed with a few good stories! Goodnight Lad is a children's board book that the entire family will enjoy. I knew my children would be super excited to read it together, even more so because it's a magical book! 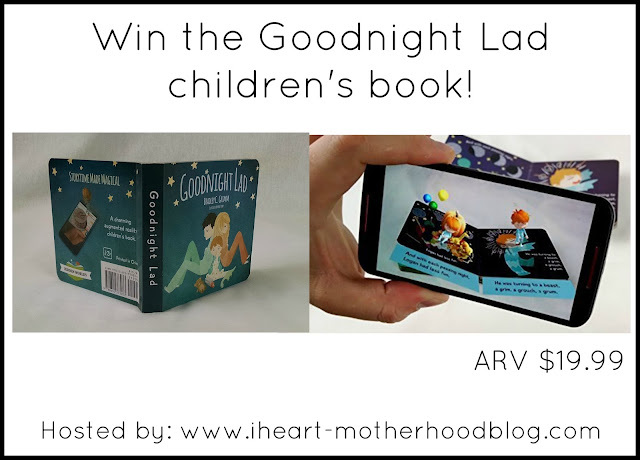 Goodnight Lad isn't just your regular board book, it's a magical children's book! Using your smartphone, download the free Goodnight Lad app and grab your book! Reading Goodnight Lad is fun for anyone and everyone, simply follow the steps with in the app. Point your phone towards the pages in your book, if needed tilt the book and move your phone a little closer to get a better view. To interact with the book, simply tap your phone, the narrator will read you the story. Sit back and enjoy Goodnight Lad with your family! Each page in Goodnight Lad comes to life with beautiful animations that you can interact with to really get into the book. Your children will love reading the story of a cute little boy who refuses to go to bed. Logan loved to play and have fun, but as the days go on, he gets more and more cranky. His parents knew they had to come up with a plan to tire their little lad out. After visiting fun new places like beaches and going to parties, Logan was having less fun and turning into a grouch. Eventually the little lad tired out and closed his eyes! My daughter really loves this book, both of my kids are iPhone/iPad savvy, so I had a feeling Goodnight Lad would quickly become a favorite to read! It's perfect for beginner readers and young learners, it's colorful and easy to follow - plus using the iPhone makes it even more interesting! So what do you think about Goodnight Lad? Check out the video below to find out more about Goodnight Lad and to see the book in action! Connect: Be sure to stay connected with Goodnight Lad on Facebook and Twitter! Buy it: Download the Goodnight Lad app for free! The book can be purchased for $19.99 online at Amazon! Win it: One lucky reader will win a copy of Goodnight Lad! Such a cool idea and a great way to get kids interested in books. My 3-yo would love this!